Brundage headed the International Olympic Committee in an attempt to ban product endorsements by amateur athletes. 1941, No place. 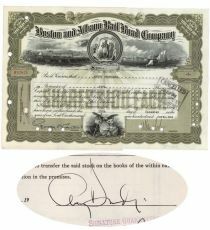 Stock certificate issued to and signed on attached receipt by AVERY BRUNDAGE (1887-1975) American athlete, sports official and philanthropist. Brundage served on the United States Olympic Committee and as president of the International Olympic Committee. Green / Black. Vignette of a stylized Massachusetts’ State Seal at top center flanked by vignettes of a scenic rail scene at left and of a maritime scene at right. Punch and stamp cancellations do not affect Brundage’s signature. Overall Fine.